Toshiba has released a new generation of DesignAIRS, an air conditioning system design software, that for the first time enables contractors to carry out both split and variable refrigerant flow (VRF) system selections and automated EN378/F-GAS compliance checks. Toshiba Carrier UK Ltd (TCUK) is a joint venture between Toshiba and Carrier in the United Kingdom, and is a part of Carrier, a leading global provider of innovative heating, ventilating and air conditioning (HVAC), refrigeration, fire, security and building automation technologies. DesignAIRS was originally developed by Toshiba in Europe, and the company recently adopted the system as its global air conditioning design platform, developing and rolling out a completely updated version of the software. While the first generation of DesignAIRS covered only VRF systems, the latest version enables a range of technologies to be added to designs, including split systems, heat recovery, hot water modules and DX-based air handling units, dramatically expanding its application. In addition to creating detailed project drawings for a variety of building types, including pipework and equipment specifications, the new version includes a seasonal performance calculator that allows designers to simulate the actual performance and running costs of a system using local seasonal temperatures and operating conditions. Different tarrifs can be used for the calculations to estimate running costs under alternative supply contracts. Designers can simulate the anticipated running costs of a system for end users, and how much CO2 it will produce in a year. 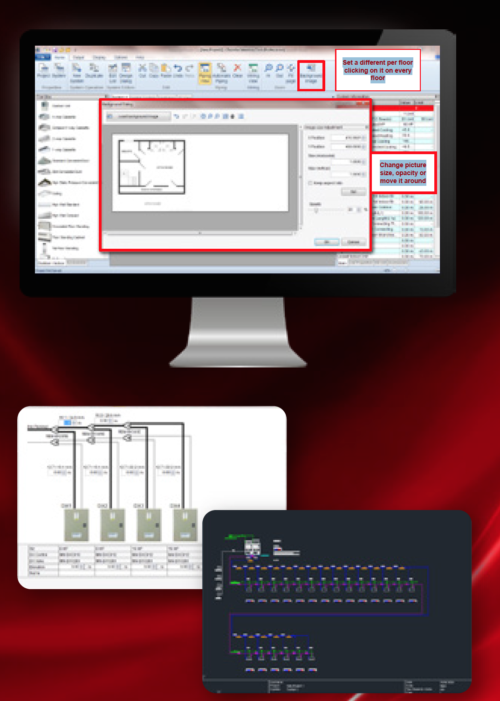 Air conditioning designers can now also import building floorplans and use them as background layouts, assisting clients and installers to visualise the completed system as installed within the building. Toshiba Air Conditioning is a division of Toshiba Carrier UK Ltd, a joint venture between Toshiba Carrier and Carrier in the United Kingdom. Toshiba UK provides sustainable solutions integrating energy efficient products for residential and light commercial customers. Toshiba Carrier UK and its subsidiary companies are a part of Carrier, a leading global provider of innovative HVAC, refrigeration, fire, security and building automation technologies.